It was standing room only during the dedication of the Fohla Féde Seventh-day Adventist Church, in São Tomé and Príncipe, on January 19, 2019. 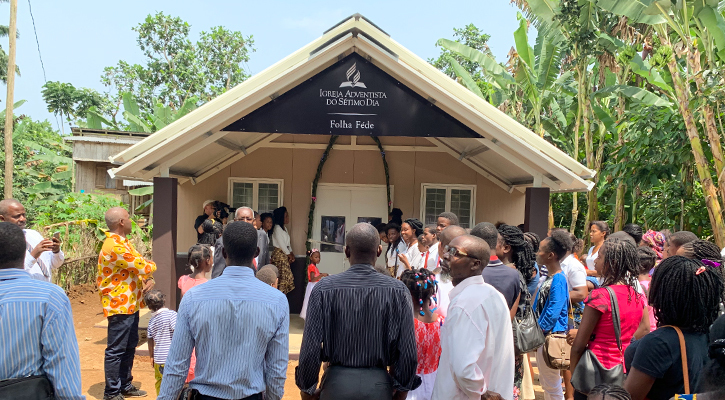 More than 100 people attended the ceremony at the new sanctuary, which was constructed by Maranatha Volunteers International as part of the recent effort to provide churches and school classrooms on the island of São Tomé. The new space is a far cry from their old place of worship. Previously the Folha Féde congregation met in a patio space underneath a home. The dirt floors, lack of light, and crowded conditions made it a difficult place to worship. But it was the only option available. The Folha Féde congregation started in 2017, when a team of young Adventists from a neighboring church organized evangelism meetings in the community. The program resulted in 10 baptisms and the formation of a small group; they began meeting under the house. Over time, the group increased to more than 100 members. When Maranatha arrived in 2017 in response to a request for construction assistance from Adventist leadership in São Tomé, Folha Féde was on the list. Although they were a young congregation, the group was growing, vibrant, and engaged. After Maranatha confirmed Folha Féde to receive a new church, the membership was busy prepping their new property, located just down the street from their old meeting space, for construction. For days, everyone helped to level the land. From delivering loads of rocks to shoveling dirt, the members volunteered every spare moment they had to prepare for Maranatha’s crews to pour the foundation and build the church. Finally, in January 2019, the new temple was completed. On the day of the dedication, the congregation met in their old church, then marched down the street to their new place of worship, singing the whole way. Michelson Trindade, 25 years old, is one of the people who helped to start the Folha Féde church. Having failed to secure a seat in the crowded sanctuary, he watched the ceremony through a window. He didn’t mind his view; he was just happy. Folha Féde is the fourth Maranatha church to be completed in São Tomé and Príncipe since starting construction in early 2018. Volunteers and crews have also completed eight classrooms and are currently building bathrooms at the International Adventist College – Cosme Mota, the only Adventist elementary school in the country.